How To Change Desktop Background And Screensaver On Mac? Since the introduction of macOS Mojave, Mac desktop backgrounds got quite a bit more lively and dynamic, adapting to the exact hour of the day. But even then, let’s face it, default Mac backgrounds are pretty boring. When everyone sports the same wallpaper as you, it comes across as a sign of laziness and conformity. Luckily, we can easily spice things up! There are lots of options for you to choose as your background, from a set of default ones to anything customized. Here, we’ll explore how to change background on Mac quickly as well as touch on how to change screen saver, so you never get tired of looking at your Mac. If you simply want to switch away from the default Mac desktop wallpaper, you should first try one of the Apple backgrounds already pre-installed on your Mac. To divert from Apple’s preselected style, Macs allow you to set any image of your choice as a Mac desktop wallpaper. 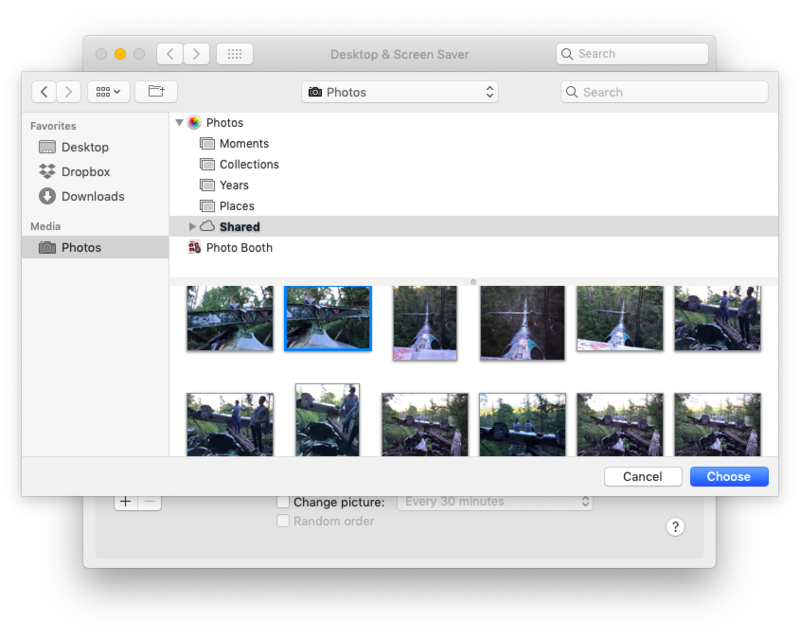 Simply find the image anywhere on your Mac, right-click on it, and select Set Desktop Picture from the menu. 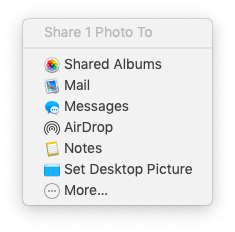 In case your image is in the Photos app, open it up, click on the share icon, and choose the Set Desktop Picture option from there. When choosing a custom background, check that it fits the desktop just right. If not, adjust the fit by selecting a dropdown and picking from either Fill Screen, Fit to Screen, Center, etc. Most of the time, the image folder you set to be rotated is the one from your recent trip or maybe even a photoshoot. Hence it’s likely to contain lots of similar photos: the ones taken from the same angle of the same object. How do you get rid of them? Going through the whole folder yourself and deleting all near duplicates one by one is boring and time consuming. Instead, you should use an automatic solution. 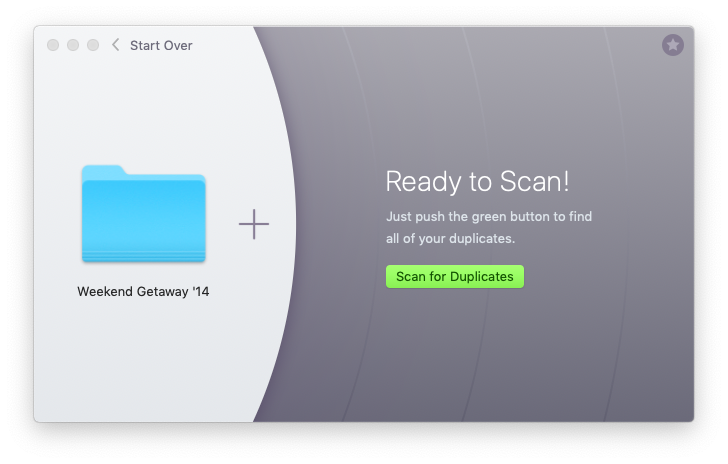 Gemini is a lightweight but mighty duplicate finder utility for your Mac. Its AI-based algorithm not only finds the exact duplicates in any folder on your Mac, it also compares all the similar pictures and preselects the redundant options for a one-click removal. Don’t worry, Gemini makes it easy to restore any files that were wrongly deleted. Once you’re sure no duplicates or similar-looking images are left in your picture folder, you might want to adjust them in one way or another for a better look. It could be that your images are of a different size than the MacBook Pro backgrounds, or you’ve been shooting in RAW format and need to convert images to .jpg, for example. Again, you probably already have a one-by-one workflow that does this, but is there a faster way? 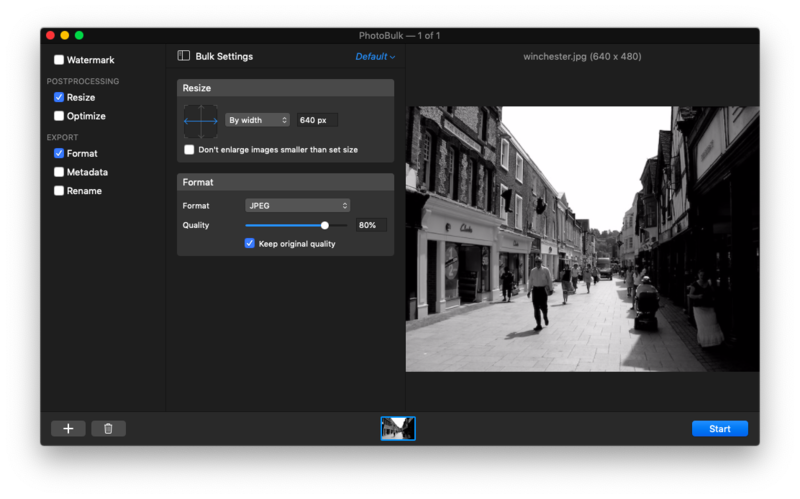 PhotoBulk is a powerful image processing app that was designed to work specifically with batches of photos, editing dozens or hundreds at a time. It’s perfect for resizing, changing formats, renaming, compressing, and watermarking. Now when you got rid of all the duplicates and made the necessary edits to your photos, you can add your photo folder to Desktop & Screen Saver and be sure it’ll look good there. Having your photos rotate as your MacBook backgrounds is great. But what if you don’t have any high-quality pictures around? Or just don’t want to spend any time setting something up? Wallpaper Wizard was created to rescue your Mac desktop wallpaper and bring beauty and inspiration to it. The automatic rotation function is already built in and you can choose from more than 35,000 high-quality royalty-free images to keep your collection ever-fresh. You can also create your own Rolls by clicking on the plus icon of specific images. And if you just want one of the beautiful Mac desktop backgrounds from Wallpaper Wizard to be static, simply open it up and choose Set Desktop Picture. 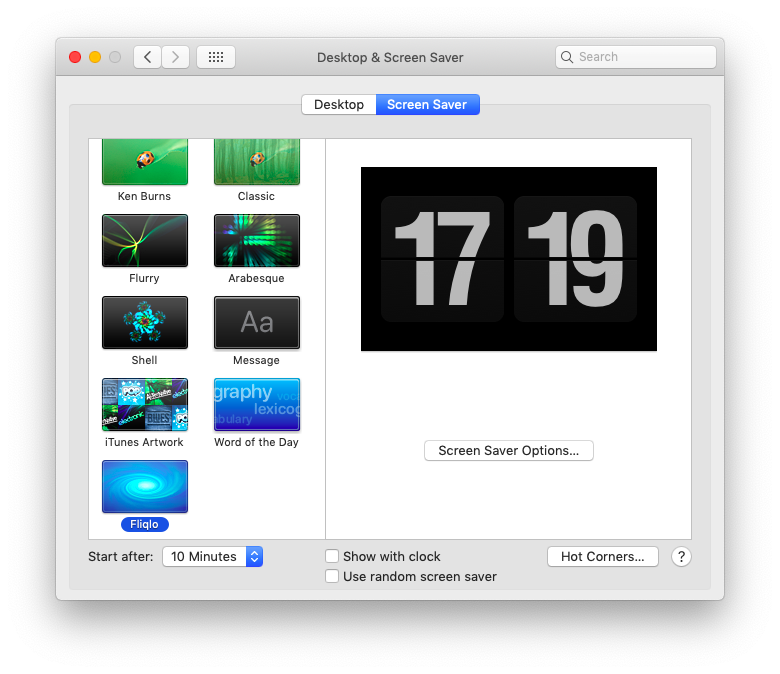 Once you’ve decided what your MacBook backgrounds should be, you can similarly adjust your Mac screensaver too. You know that you have a screensaver on your Mac by default, right? 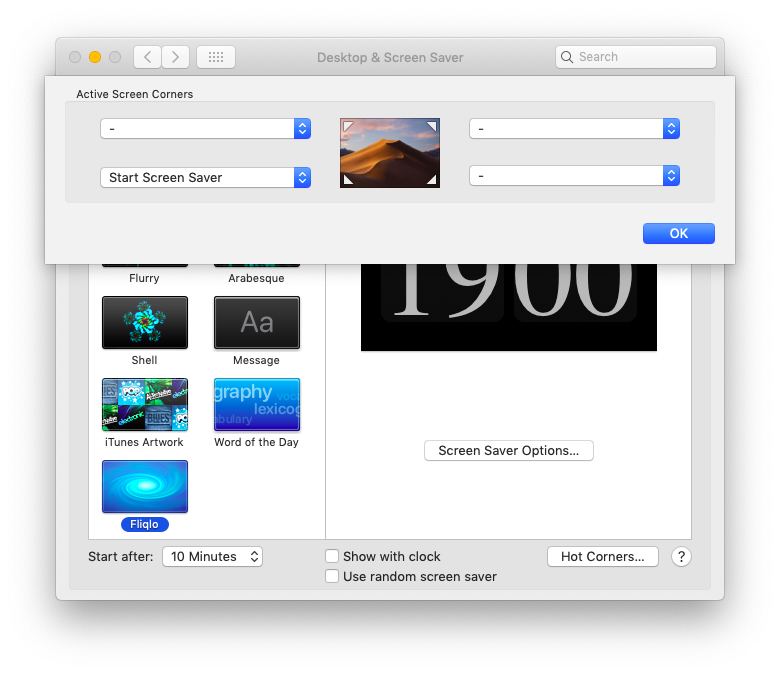 To see your current Mac screensaver, just go to System Preferences ➙ Desktop & Screen Saver and navigate to the Screen Saver tab. Your default screensaver would appear on the right. If you want to change it, you can simply explore all the options on the left and click on the one you like. Additionally, many screensavers would present customization options for further adjustments. You might be wondering how to change screen saver to something custom. First, you need to find a suitable screen saver online and download it. The screen saver should have a .saver file extension. Then to install it, either double-click on the file or move the file to your Library ➙ Screen Savers folder. Now you should see the new screensaver in the Desktop & Screen Saver list. Since you now have a perfect Mac screensaver in place, there’s one more thing you can modify to make your computer more secure overall. Hot Corners is a great little feature that triggers a certain action when your cursor reaches one of the corners of your screen. What you want to do here is set a Hot Corner to lock your Mac and start a screensaver. From now on, when you move your cursor to a given corner, your beautiful new screensaver will start and your Mac will lock. It’s strongly suggested to do this every time your step away from your computer to keep your data safe. 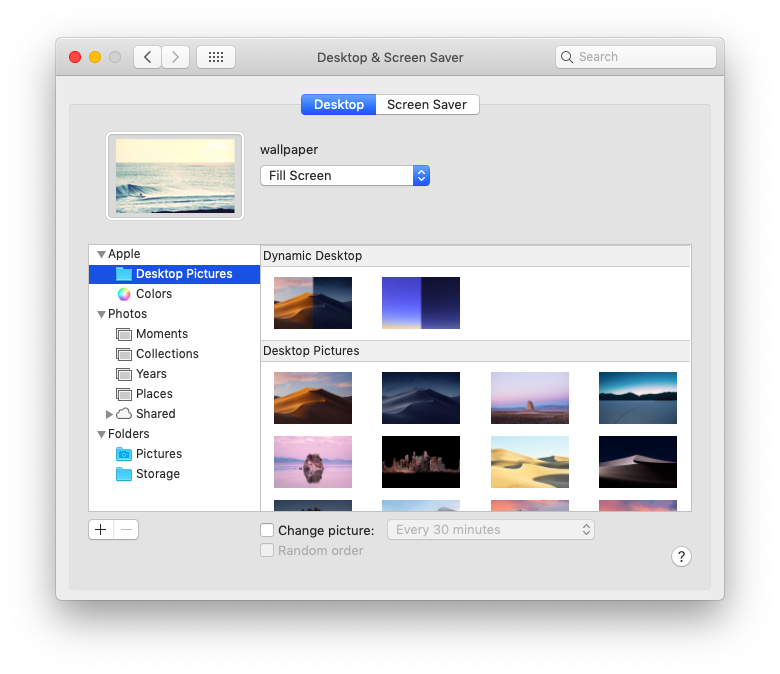 So set up a rotating Mac desktop wallpaper, whether it’s your personal archive, quickly processed with Gemini for duplicates and PhotoBulk for retouching, or Wallpaper Wizard with its gorgeous HD rolls of images. Then install one of many custom screensavers for Mac and configure Hot Corners to improve your laptop’s security. Best of all, you could use all the apps mentioned above free for a limited time through Setapp, a platform of more than 130 Mac apps that improve your daily workflow and ensure a beautiful user experience. Enjoy the view!